Drag & drop mailbox folders, extract attachments, Export messages etc. Exchange recovery tool can recover full mailboxes from corrupt Exchange email databases (offline EDB/STM files) and from Exchange backups, after the event of Exchange Server failure. The software repairs EDB file and restores deleted Mailboxes, folders, messages, file attachments, contacts, calendars etc even in the severe case of Exchange Server crash. An easy and hassle-free approach to migrate from one Office 365 account mailboxes to another Office 365 mailbox. The EDB recovery tool also exports Office 365 data to PST, online exchange server mailboxes without affecting the mailbox users. It allows smooth migration of single/ multiple mailbox(es), archived mailboxes, and public folders. Move your user's data from old versions of Exchange to newer Exchange versions (including 2013, 2016, 2019) with zero impact and data loss issues, using Kernel for Exchange Recovery tool. It is an effortless way to migrate your thousands of mailboxes from one Exchange Server to another Exchange Server. The EDB recovery tool allows easy export of the data by using Copy – Paste, and Drag – Drop functions. This feature gives users great benefit, it ensures that total items are copied at the designated folder of the matching mailbox. Drag-and-drop feature which does not need any technical expertise any user can easily export selective messages from source folder to the destination folder using this feature. It also has a special feature to extract the attachments from specific emails or from all the emails of a mailbox folder. Advanced search feature allows finding specific email or items within multiple mailboxes. The Exchange Server recovery tool has an extensive search function that reaches to the bottom of database layer to render the accurate search. You can find messages containing specific phrases/words, search within attachments (attachment body, type, size), Date range, and more. Also, you can save custom searches to load the same search every time, without re-creating them repeatedly. Migration from IMAP servers (like Gmail, Yahoo, Hotmail, and GroupWise) to PST file, live Exchange Server, Office 365 mailbox, This solution gives easy and user-friendly options and filters for exporting the data from IMAP servers to live Exchange mailboxes and office 365. Kernel for Exchange recovery tool has an inbuilt backup extractor that facilitates direct data recovery from Exchange backups. It remarkably cut-downs the efforts involved in lengthy traditional process to restore entire backup setting up a recovery server. Generate reports to analyze the mailbox data flow based on following parameters – senders, receivers, attachments, dates, and messages. Operation logs are the easiest way to track the status and details of all the operations performed till date. Exchange recovery software allows to view all your log details based on the selected date and time of the operation logs. Administrators can create the folders and mailboxes to destination Exchange Server. It even allows having full access to destination mailboxes – such as create, delete or rename any folder; create a new mailbox in Exchange Server etc. 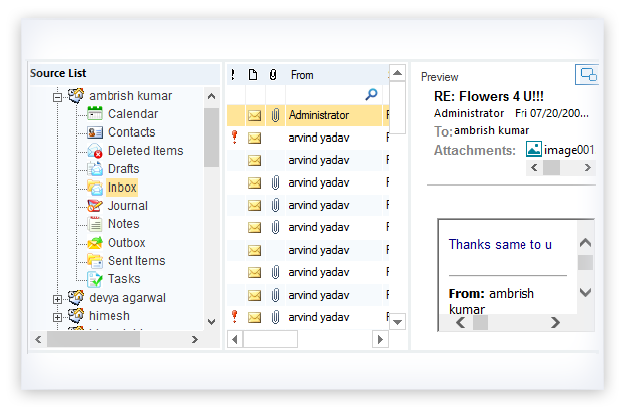 Various operations can also be performed like delete any item, ‘reply’ or ‘forward’ any email message from the connected Outlook profile. Kernel for Exchange recovery tool has a preview pane to read the information of the selected item or message from source & destination lists. You can read full message (along with attachments), contacts, etc. before saving. The tool allows to delegating full access rights to Office 365 user mailboxes. This can be done from the interface of the tool (no need to login to Exchange admin center). The recovery tool offers recovery of public folder data from corrupt and damaged EDB files. It also restores lost or deleted public folder items (from both Office 365 and Exchange). And you can save specific items from public folders to the required destination. The software supports Unicode Exchange database files for recovery. Exchange database files with Unicode characters are recovered swiftly by this software and are saved to different destinations including Unicode PST files. What to look for in an Exchange recovery solution? Recovered emails can be saved to EML format with this recovery software. Among the many saving options, choose Save as EML to save the retrieved Exchange emails to this format. The Exchange Recovery software recovers the data archived by the mailbox users. It efficiently restores archive mailbox items and saves them securely to the desired destination. Recover Exchange Server 2003 database Recover deleted emails to PST, EML, MSG, etc. 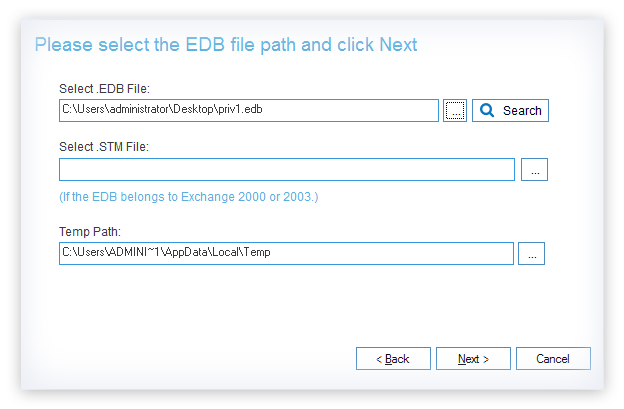 How is recovery possible for a corrupt Exchange database (EDB) file? Run the software and select the Offline EDB File option from the available source options. Select “Standard Scan” or “Deep Scan” as the scanning mode. When the source EDB file content is displayed, select Export Mailboxes to PST from the right-click menu. It will open a wizard where you can easily filter the mailbox data. Provide the required options and click Export. Repeat the same process for bulk migration of PST files with administrator privileges. Can your product convert corrupt EDB file to existing PST file? Yes, our software does that. You can recover corrupt EDB file and then restore the mailbox(es) into an existing PST file. Is there any limitation in the size of EDB file to be searched? No, there is no limitations in the size of EDB file for the search operation. Is the tool compatible with Office 365 Business only? No, the import PST to Office 365 tool is compatible with all Office 365 editions. I have multiple mailboxes in one EDB file, so can I create PSTs for all of them at once? Yes, you can. 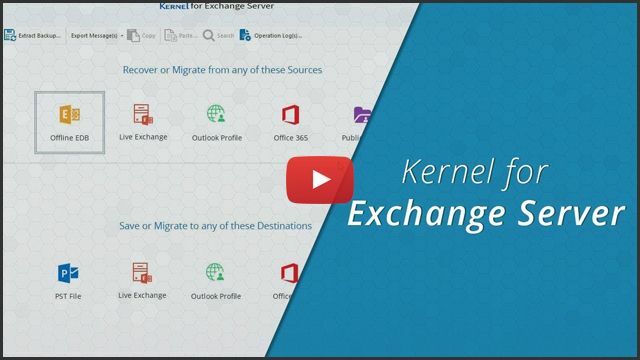 Kernel for Exchange Server allows you to migrate all user mailboxes at once from EDB file to PST files. It also lets you to split the large-sized PST files into smaller sizes for better PST management. Does the tool transfer the data from Exchange public folders to Office 365 public folders? Yes, it allows to migrate data from Exchange public folders (EDB file) to Office 365 public folders. Do I have to create the Office 365 public folders before going to transfer the data or does the tool create it? No, the tool doesn’t automatically create a public folder. The user has to create a public folder manually for transferring the data. I am having trouble mounting my database due to the dirty shutdown state. Can your software recover my user mailboxes and all the content and restore into Exchange Server? Yes, the tool does that. It allows you to recover user mailboxes from corrupted or unmounted EDB file and restore it to live Exchange Server into healthy state. Do you have any report that will tell me what can be restored? The tool has live preview facility to allow you to access the source data (from EDB file and others) and let you decide what or whatnot has to be restored before the migration takes place. Can I export the EDB mailboxes directly to Exchange? Yes, you can. The tool allows to export all/selective mailboxes from EDB file to live Exchange Server in single attempt. Does the tool export all mailbox contents: contacts, calendar, mail, etc.? Yes. The tool exports all mailbox content (including email messages, attachment, calendar, contacts) from source platform to the desired destination. Does your product allow me to export in UNICODE PST? Yes. The tool supports the migration of Unicode characters. You can choose the option to ‘create a Unicode PST’ file when selecting PST as your destination platform. Can I migrate from Exchange 2007 to 2016 directly? Yes, the tool allows you to directly migrate mailboxes from Exchange 2007 to Exchange Server 2016. What is the limitation of Demo Version of the Software? Demo version is available free of cost. However, with the facility to recover and preview the corrupt EDB files. It comes with an exclusive migration facility to restore EDB files (25 items from each recovered folder) to PST file, live Exchange Server or to Office 365 mailbox. To save unlimited number of EDB files, you need to purchase the software. Are upgrades and technical support free? Yes. Software upgrades and Technical Support are free for lifetime. Can I install the Kernel for Exchange Server Technician License on two different forensic workstations? Yes, you can install the software on as many workstations as you want using the Technician License. Does the corporate license backup live exchange DAG or a single database? No, the corporate license does not backup Exchange files. To do so, you’ve to upgrade to Technician license. Does this tool has an option to avoid migration of duplicates items? Yes. The tool automatically skips duplicate items during export, migration, or recovery. However, you can retain the duplicate items just by clicking the Export duplicate items checkbox of the wizard. I want to know what can I do if my Office 365 mailbox doesn’t have full access rights over multiple mailboxes? The tool has the option to assign full access rights to an Office 365 user mailbox. With this option, you can delegate full access rights to any user mailbox from the software console itself. While performing Exchange Server recovery, I am getting an error message “Out of Memory”. What to do? The 'Out of Memory' error message occurs when EDB file is very large. You need to attempt the Exchange recovery once again; this time selecting "Use Disk Space" option after selecting the required recovery note. I want to move only the contact details to Office 365. Can I do that? Yes, surely you can migrate the contact information selectively. On its Filter Selection window, there is a feature named Item Type filter. Just check the Contacts option and uncheck all the others. I am getting message “Invalid Class String. Please make sure Outlook is installed and configured properly.” How to solve this? This message comes up when either Outlook is not installed on the system or if Outlook is installed, then it is not configured properly. If Outlook in not present, install Outlook on the system where software is running. If Outlook is present, then make a new POP profile in Outlook (it can be a dummy non working one). Uninstall and reinstall the software and then try again and it´ll resolve your issue. Do you have any technical question regarding Exchange recovery software? If yes, email it to us at support@nucleustechnologies.com and we´ll assist you promptly. Do I need to have MS Outlook installed on the system where I run the recovery process? Yes, MS Outlook installation is a must. At least one profile should be configured in the Outlook. You can configure any temp profile, configuring working profile is not mandatory. Can I install the software on Windows 10/8/8.1? Yes, you can install the software on all versions of Windows operating system – including Windows 10, 8.1, 8, 7, Vista, XP, 2000, 98, NT and 95 and all Windows server 2012, 2008 R2, 2008, 2003 R2, 2003. Does your software support Exchange 2007/2010/2013/2016/2019? Yes, it supports all the versions of Exchange Server including 2019, 2016, 2013, 2010, 2007, 2003, 2000, 5.5 and 5.0. Kernel for Exchange Server has an open-view interface allowing easy management of source and destination list files, at one place. Below is a three-step simple procedure to add and recover source EDB file. SelectSelect EDB as source file for scanning. PreviewView all the recovered mailboxes of EDB file in the source list. Select any item to view it in detail in preview pane. SaveRestore EDB file (single or multiple mailboxes) in PST file simultaneously. I am utmost satisfied with the features of the tool and its assurance of successfully recovering the data. Wonderful work!!! A multitudinous software application facilitated with all the technological features. Great design and assured recovery. With increasing use and constant demands from users, a new update of the software has been released for Kernel for Exchange Server. The latest update of Kernel for Exchange Server is introduced with version 19.0. The latest version incorporates enhanced recovery of Exchange 2019, 2016. Also, the algorithms of the tool have been upgraded to provide enhanced connectivity to on-premises Exchange. With the updated version, users will be able to recover their data more conveniently. Keeping the trend of updating its software at regular periods, Kernel introduces the Kernel for Exchange Server Recovery tool with updated features. Now it can export mailboxes from Exchange Server 2019. While exporting live Exchange/Office 365 mailboxes to PST, you can choose to set name of new PST file as same as mailbox email address. These new features are expected to be very useful for users. Pleased to announce the new version of Kernel for Exchange Server Recovery Software – 18.3. After many performance enhancements and minor bug fixes, the software now is more efficient in terms of speed and accuracy. Also, the software now allows saving live Exchange mailboxes to multiple PST files with its split option. With the new updates, the usability of the tool is expected to increase considerably. Kernel announces the release of an updated version of Kernel for Exchange Recovery tool. EDB recovery and migration is more easy and efficient with this updated version. The enhanced features like Preview, filters, etc. helps in improving the usability of the tool. In total, the new 18.2 version ensures flawless EDB recovery and migration in all versions of Exchange. Kernel for Exchange Server has been upgraded with many improvements. The tool now works flawlessly with all the cumulative updates for Exchange Server 2016/2013 (up to CU7 for Exchange Server 2016 & up to CU 18 for Exchange Server 2013). With the improvement of the ‘Custom Selected’ feature, users can now easily select mailbox folders for recovery/migration. The new version has a more intuitive user interface, making it easier to use. Also, the tool works smoothly even with large Exchange databases. The much anticipated Kernel for Exchange Server software Version 16.1 is now more user-friendly and has been upgraded with dynamic features. The upgraded version incorporates better options to manage and specify Date field in calendar, and offers extended support to Unicode characters for various languages including Japanese, Chinese, and French. It also facilitates improved recovery support for EDB files belonging to Exchange versions: 2016 and 2013. Plus, now a user can even search out or save EDB files in a quick time, and its free trial version permits a user to save 25 items per folder from recovered EDB files in PST files, Office 365, or Live Exchange Server. The much-awaited and improved Kernel for Exchange Server Recovery Version 16.0 has been successfully rolled-out for official use. The upgraded version incorporates enhanced technical advancements and new "Ask for EDB Version" option to make selection of appropriate Exchange server version of respective EDB file. In addition, the tool is also quite easy to perform exchange 2013 & 2016 recovery. Lepide Software Pvt. Ltd. has rolled-out some important updates with its latest version 15.9 for Kernel for Exchange Server software. This updated version intends to facilitate smoother data migration from Public folder/Archive (EDB files) to Office 365 Public folders and Archive mailboxes. Kernel for Exchange Server V15.9 also provides enhanced filtering options to perform accurate mailboxes mapping from source to target environment. Furthermore, the recent version also aims to provide accelerated speed for performing quick & efficient EDB to Office 365 data migrations. There is an enhanced support for Hosted Exchange Server with this update. Lepide Software Pvt. Ltd. launched the updated version 15.8 of Kernel for Exchange Server Recovery. The latest version now migrates recovered EDB file to Public or Archeived mailboxes and supports latest versions of MS Exchange, Outlook and Windows. Lepide Software Pvt. Ltd. proudly announces the launch of latest version 15.04.01 of Kernel for Exchange Server. The latest version dynamically now also supports the migration of restored Exchange database to the Office 365. Lepide Software has successfully launched the updated version 15.02.01 of Kernel for Exchange Server Software. Equipped with advanced data recovery algorithms, the updated version now also provides the facility to even migrate the recovered mailboxes to Live Exchange Server with just few mouse clicks. Lepide Software announces the release of an updated version of it Exchange Recovery Software, Kernel for Exchanger Server. The new version 14.05.01 features few major upgrades that ensure better performance with several bug fixes. 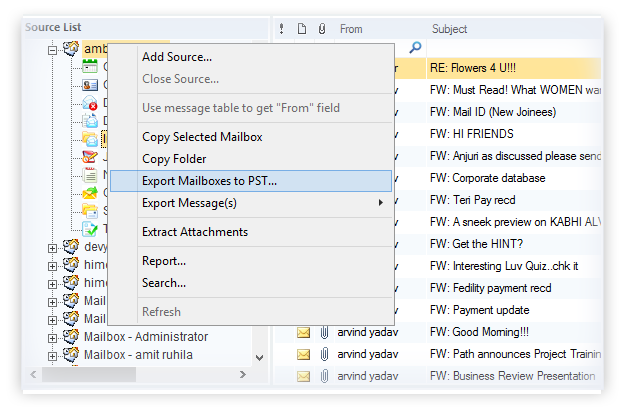 The software now supports all editions of Outlook 2013. Introduction of a better duplicate items filter keeps duplicate entries at bay. Permanently deleted items can now be previewed and exported as per user’s choice. Also, deleted items are highlighted in red color for Exchange 2000, 2003 and 2007 versions. Lepide Software Pvt. Ltd. announces the release of updated version of Kernel for Exchange Server. The new revised version 13.04.01 is integrated with advanced technology, and capable of restoring inaccessible emails of MS Exchange Server 2013 mailboxes instantly. Smartly programmed, the new version doesn't require technical assistance to function and can recover the complete EDB database mailboxes within small time interval. Updated version of Kernel for Exchange Server is now available. The updated version of the software is embedded with more powerful algorithms to recover all mailboxes and their items such as emails, tasks, notes, journals and calendars without any interruption or flaw. In the updated version of Kernel for Exchange Server issues related to recovery of distribution list and saving recovered data have been resolved. Nucleus Data Recovery launched Kernel for Exchange Server version 10.10.1. The updated version of the software with some minor bug fixed is now available to provide Exchange server administrators with more powerful EDB recovery. Updated version 9.09.01 of Kernel for Exchange Server has been launched today. The EDB repair software with new recovery modes now supports Exchange mailbox recovery in cases of Dirty Exchange shutdown, Checksum errors and supports rebuilding of corrupted Exchange Database to new working EDB database. New updated version of Kernel Recovery for Exchange Server, .edb repair software was released today. With new Graphical User Interface, the updated version now has new recovery engine which is more powerful than its previous version and few bugs are also fixed for more efficient email recovery. Kernel for Exchange Server recovery software updated to recover inaccessible, corrupt and damaged emails from MS Exchange Server database files. now has much powerful recovery engine and effectively handles the major corruption. Kernel for Exchange Server email recovery software launched to recover inaccessible, corrupt and damaged emails from MS Exchange Server database files. The exchange server recovery software supports MS Exchange Server version 2003 and 2007. Now easily convert .EDB file to .PST and access emails with Microsoft Outlook email client. Deleted emails, attachments, zipped attachments, images, email properties, email content is effectively recovered with .edb recovery software. Migrate mailboxes/public folders from Exchange and Office 365. Recover mailboxes from EDB, OST, or PST to Exchange & Office 365. Convert OST files to PST/MBOX/MSG/Office 365. Completely satisfied with the performance of the tool, as it helped to migrate data from Microsoft Exchange 2010 to Office 365 successfully. Soon after analyzing the client's issue, the Kernel Data Recovery team gathered all the necessary data to fix the client's problem. Capital Network Solutions was finally able to perform smooth transition of complete mailbox data from older Exchange version to newer one without any hindrance. Kernel for Exchange Server migrated the restore items to live exchange server the client was very much satisfied as the tool helped to migrate Exchange Server 2010 mailboxes to Exchange Server 2013.